You are checking out Part 3 of the Real Foods of India cooking series. 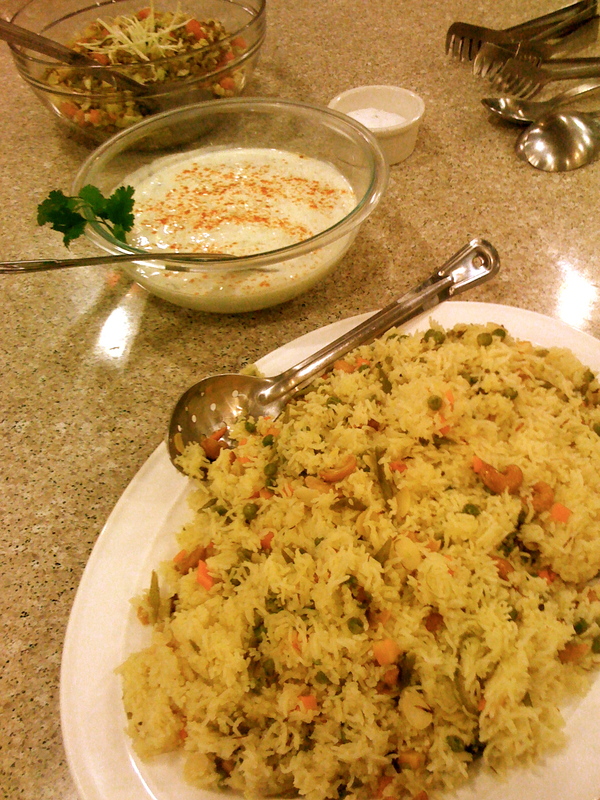 I learned so much from the “Real Foods of India” cooking class at Milestone Culinary Arts Center, led by Minal Jhaveri. We’ve already covered some amazing recipes in part 1 and 2, and now I wanted to share with you two more amazing recipes for, Saag Paneer and Saffron & Nuts Pulav. I enjoyed my experience so much that I recently attended an Indian Breads cooking class led by Mrs. Jhaveri. I can’t wait to share all five of the amazing breads we made in another series. So enjoy the following culinary treats and don’t forget to check back for my final blog of the series next week. You don’t want to miss the final two lip-smacking recipes! 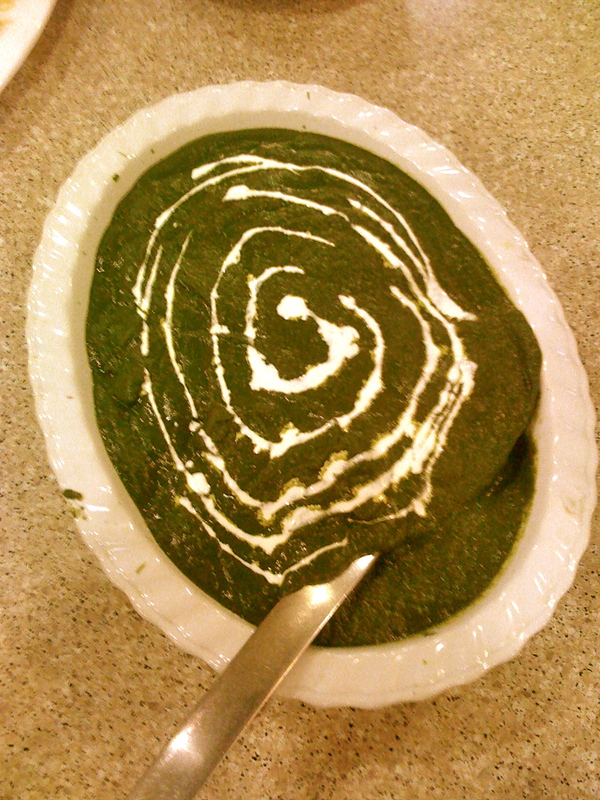 Indian cottage cheese in a spicy spinach curry. Can be served with rice or naan (Indian bread). If using the slab-cut cubes, place on a baking dish. Brush with ghee and broil for a few minutes, or until slightly brown. Heat 1 tbsp ghee in a pot, saute chopped onions, garlic, ginger, cloves, red chili pepper and Kasoori Methi leaves for a few minutes, or until the onions are golden. Remove from the heat and blend mixture, in a blender or food processor, with 1-2 tbsp water to form a smooth paste. Set aside. Tip: You do not need to rinse out the blender in between step 1 and 2. Cut the paneer in 1/2 inch cubes. Brush with ghee and broil on high for a few minutes until they are slightly golden brown. Heat 1 tbsp ghee or oil in a pot. Add cumin seeds, saute for a few seconds, and add onion garlic paste. Saute for a few minutes. Add garam masala, coriander powder, salt and turmeric. Saute for 3-4 min. Add tomatoes and saute until soft. If the paste is too dry, add some water from the blended spinach or a few spoons of the spinach to add moisture to the pot to avoid sticking. Add blended spinach and stir until it comes to a boil. Cook for 3-4 mintues, covered, stirring occasionally. Add cream, lemon juice, and paneer pieces, stir until combines. Serve hot. Keep in the refrigerator for 3-4 days, can freeze up to 1 month. If freezing, do not add cream. For reheating frozen saag paneer, let it thaw and heat in a pot, add cream before serving. Coriander-cumin powder (Dhana-Jiru) consists of mainly coriander. Do not substitute cumin in it’s place. A rice preparation delicately spiced with cinnamon, cloves, and a touch of saffron, mixed with nuts. Served with a curry or dal. Rinse rice 5-6 times, until the water is almost clear. Crush strands of saffron with a little water in a small bowl, or mortar and pestle. Set aside. Crush cardamom pods in a mortar and pestle. Heat ghee in a non-stick pot or a rice cooker. Add cloves, bay leaves, and cinnamon stick with the veggies (add cashew nuts and almonds if not using for garnish) and saute until the leaves and nuts are slightly brown or pinkish. Add the rice, crushed cardamon and salt and saute for 2-3 min. Add the saffron. Add 2 1/4 cups water and cover pot to cook. Saute cashew nuts in shortening or ghee until slightly brown. Garnish over rice. 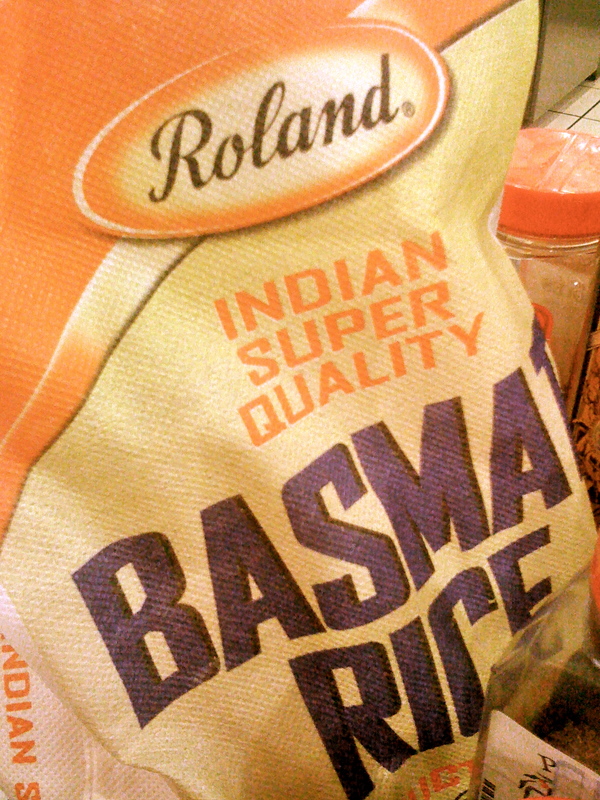 In Indian cuisine ghee and basmati go hand in hand! Joss Stone is one of my favorite female artists! I’ve been listening to a lot of her older albums recently. Instead of posting a song off one of her records, I wanted to post her recent performances on American Idol. Her voice is mesmerizing and she just oozes soul. So check out Joss Stone singing I Put a Spell on You. Click on the numbers to view Parts 1, 2, and 4 of Real Foods from India. All recipes were created by Minal Jhaveri from the Gourmet Journey. What a great experience you had in the cooking class! I’m glad you love Indian food. I will try some of these recipe. They sounds amazing. Thanks for sharing. Man I want some of that cottage cheese & spicy spinach curry w/ naan. That looks incredible babe!